An early departure though worth while! After breakfast, our representative / guide will pick you up from your hotel for your safari to Murchison Falls National Park . The drive will take you through the famous and historical Luwero triangle, Nakitoma Nakasongola . Before heading to Masindi, you will have a stop over at the Ziwa Rhino Sanctuary in to view the Rhinos. Uganda’s Rhinos became extinct in the early 1980s, after a period of civil unrest and heavy poaching. This sanctuary has now been set to breed black and white rhino, and restore Rhino populations in Uganda’s protected areas in a later stage. Basic Red Chilli Rest Camp (Low budget/basic accommodation). Full Board. Go for an early morning game drive on at the Northern Bank of the Murchison falls National park Expect encounters of unique African Savannah like giraffe, elephant, antelope, lion, and the hundsome Uganda Kob. Return to the lodge for mid morning breakfast, as you relax to wait for Lunch. After lunch, you will go for a launch cruise on the Nile River. The cruise takes you to the Bottom of the roaring falls where you will see huge crocodiles, schools of hippos, buffaloes, elephants and a variety of water birds like herons, ducks, cormorants, bee-eaters, skimmers, kingfishers, fish eagle and the rare shoebill. There is an optional hike to the top of the falls which takes an hour or two if you are flexible enough. The trails at the cliff of the Nile at the bottom of the falls takes you to the Top of the falls to view the thunderous roars of the Nile 46 metres wide plunging its self into a 7 metres wide gorge. The hike is strenuous on steep cliff but a successful hiker will call it a worthwhile! Return to the lodge for dinner and overnight. You will take a boat ride on Lake Bunyonyi to the Various Islands. 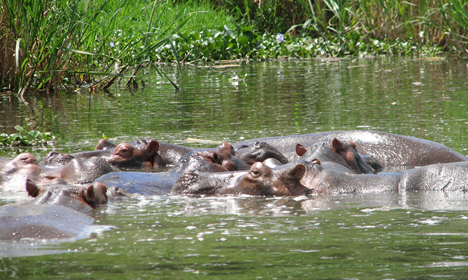 The lake is known to be the deepest in Uganda with birders’ bliss. After you will go to L. Mburo national park. Lake Mburo National Park is a pearl of a park, expediently located close to the western thoroughfare that links up Kampala to the other parks of western Uganda. Although the park is just 370km2 in size, its topography is speckled and even a short drive is alive with interest and color. You’ll pass gallery forest, open savanna and acacia woodland, rock kopjes, seasonal and permanent swamps, and open water, as you search for the wealth of wildlife it supports. This includes species such as impala, Burchell’s zebra, and eland that are not found elsewhere in western Uganda. Wake up very early in the morning for a Morning game drive in lake Mburo Np. You will be taken back to Kampala. Have a stop over at the Equator. Lunch en route.